This year I wanted to go for a more whimsical approach when it came to my Easter décor. I attached a small styrofoam ball to a styrofoam egg, and hot glued tiny silk flowers onto the “chick shape” to resemble fluffy feathers. I added eyes and an orange foam beak. 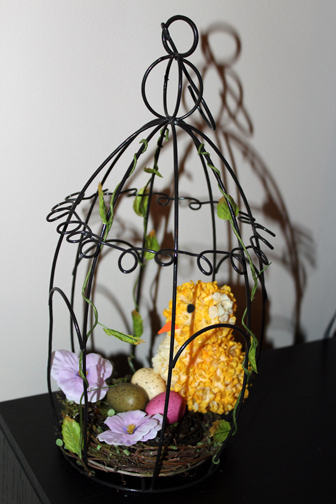 The chick was placed into a birdcage that I had nestled two wreaths and three eggs in. You can make multiple chicks to create an adorable centerpiece or fasten them to an Easter basket for a touch of playfulness. Love that! What a cute idea! I am also in love with your orange nail polish! What kind is it? SO cute! 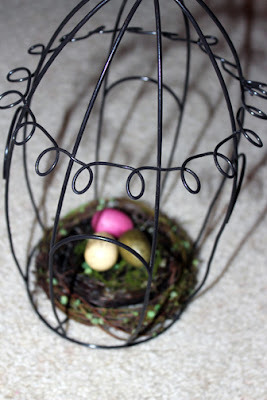 I love Easter decor, I got some of those picks from the dollar store last year and I've been waiting to use them! Love your spring decor! It turned out great! Oh my gosh, such a cute idea! I love that little chick! So cute! You're so crafty. So cute! I love DIY decor. The chick is just adorable.